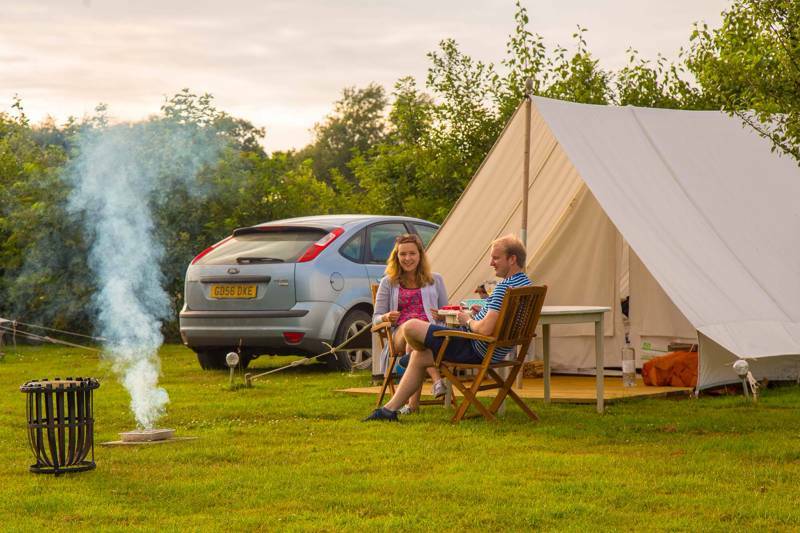 Hidden down rural lanes in North Devon and tucked amid mixed woodland of spruce, alder and many more, Ruby’s Orchard is an exclusive-use camping site – so, when you book, you’re guaranteed the entire place to yourself. It can accommodate up to eight people in its ready-pitched abodes – a pre erected vincent vango (sleeping 4) plus an extra tent if needed – and offers such modest comforts as a well-equipped off-grid kitchen, composting toilets and clever, pump-your-own showers. 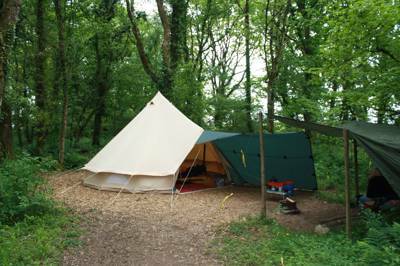 It’s certainly not quite glamping – you still need to bring your own bedding and there’s no electricity. But in all it has a ready-made back-to-basics feel, that allows you to travel light, sleep comfortably but still get in among the undergrowth and have a proper camping experience. Above all, Ruby’s Orchard remains a wonderfully wild little site. Areas of bramble and gorse have been left to thrive and provide cover for nesting birds and small mammals, while the long grass allows grasshoppers and butterflies to breed, creating enchanted little mown pathways that weave through it like natural alleyways. 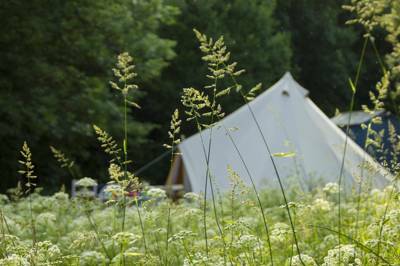 It’s an idyllic scene to survey as you kick back in the campsite’s hammock or sit and soak it in by the tiny pond. The sort of place you never want to leave. If you do make your way beyond the trees, however, then it’s best to bring a bike. Ruby’s Orchard is next to a lane that is part of the N27 National Cycle route and also just over a mile from the famous Tarka Trail. If you’re feeling energetic you can cycle all the way to Bideford, or drive there and hire kayaks to explore the Torridge Estuary. Or there’s swimming, or surfing, or going for a hike in Dartmoor National Park. Just make sure that, whatever you choose, you’re back in time to do a little stargazing. Ruby’s Orchard is blessed with blissfully dark and starry skies. Who knows, you might even spot that UFO. 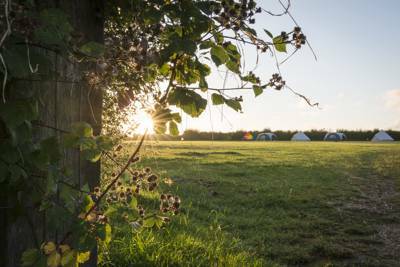 Beautifully located exclusive campsite with everything you need! Highly recommended! 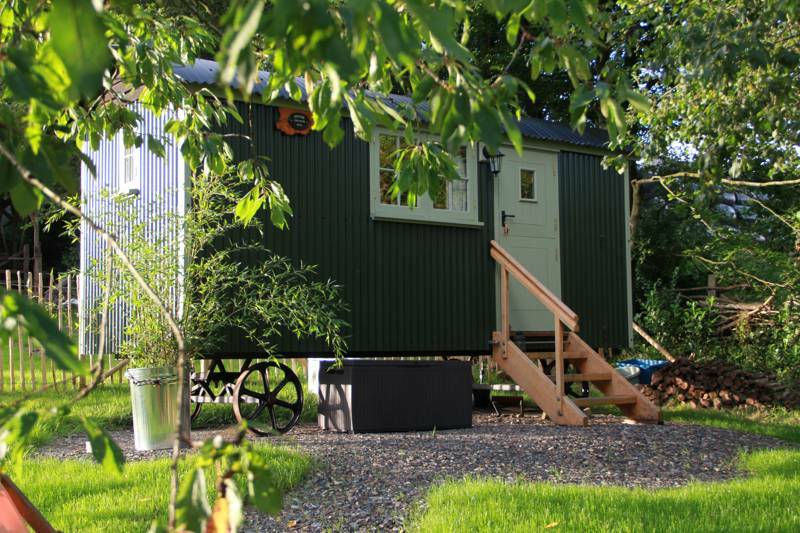 We had a fantastic few days in Ruby’s Orchard and would thoroughly recommend to others. Two friends and I wanted a relaxing camping trip to get away from it all and Ruby’s was exactly what we needed. The exclusive site is in a remote and private location yet with all the facilities and equipment we needed. This meant that we could relax, have the place for ourselves and be comfortable. 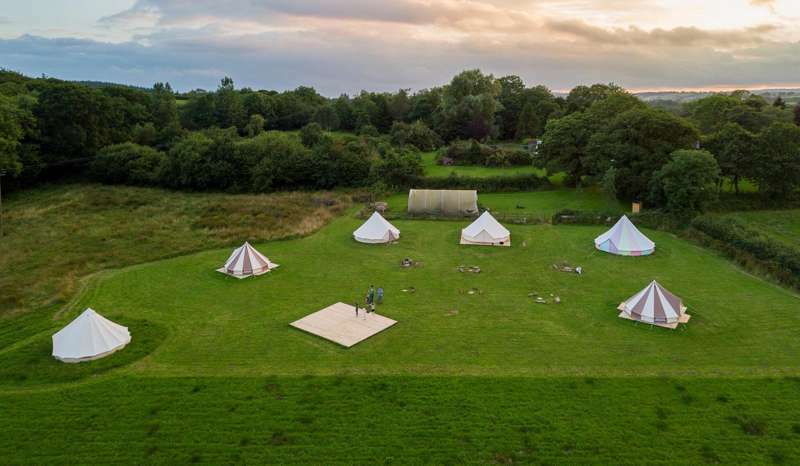 We were extremely impressed by the set-up and Lynne, the owner, has clearly put in a huge amount of effort to ensure campers have a fantastic experience. The sleeping tent was very spacious and comfortable and the kitchen tent was fully equipped with everything we needed, including tables, chairs and a camping stove. It was particularly convenient when it rained! We also appreciated the eco-loos and showers which were surprisingly good! 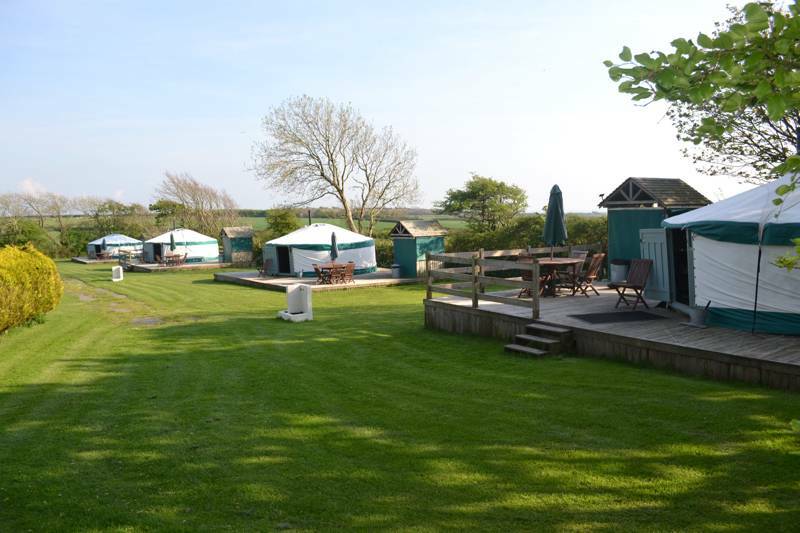 The entire campsite area is lovely and very well maintained, with various plants, flowers, chairs and benches dotted around and woodland to explore. The campfire area is where we spent the majority of our time which has plenty of seating, a large fire-bowl with a grill, a couple of barbecues and lots of firewood! The location is also convenient and the journeys to the coast and to supermarkets were a relatively easy drive. We certainly hope to have the opportunity to stay again! We stayed for 4 nights at Ruby's Orchard and the sun shone for us! 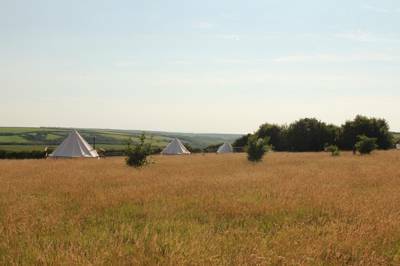 We had 3 tents, all of which were well-supplied and positioned to take advantage of the sunshine. The loos and shower block are easy to use and clean. Lynne supplied us with the best cream tea and home-made food basket, and charcoal/wood for the BBQs to help us settle in. The kids loved their own private forest where we built a den; and became addicted to pond-dipping. Torrington is 15 minutes away and is a lovely market town. 4 nights around the fire pit listening to the wild life and watching the stars in a pitch black sky was very refreshing. We recommend Ruby's Orchard unreservedly and will be back next year! Groups of up to 8 people – yes. 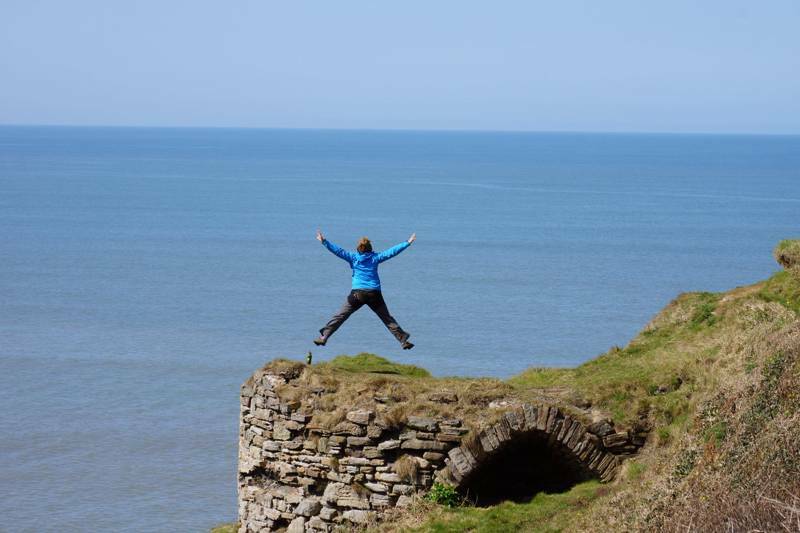 Campervans, caravans, dogs – no. The famous Tarka Trail, a 30-mile, traffic-free cycle and walking trail following the route of a former railway line, is just 1½ miles from the campsite. Bring your own bikes to make the most of it, though you can also hire them 8 miles away in Great Torrington (which is on the route). While there, visit RHS Garden Rosemoor (01805 624067) or try The Plough Arts Centre (01805 624624) – it has a great mix of films, live music and a nice café (a place to remember for rainy days) – plus there’s also access to some 360 acres of common land. Back at trail, cycle inland to Devon Wildlife Trust's Meeth Quarry Reserve or head coastwards along the Taw/Torridge estuary as far as Braunton. The ginormous sand dune system at Braunton Burrows is a UNESCO Biosphere Reserve and an excellent spot for walking and wildlife watching. 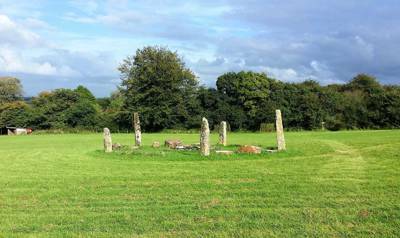 Further afield, North Dartmoor is a 45-minute drive away at Okehampton, while the North Devon and North Cornwall coasts are around 40 minutes drive. The Half Moon (01409 231376) in Sheepwash is 1½ miles away and the place to go for a pint of Doom or an evening meal. It makes for a pleasant walk if you head cross-country on the footpaths. There are 2 pubs in Hatherleigh, one with a micro-brewery, while the best café stops by day are the Yarde Orchard Café (01805 601778) – an ethical café in an up-cycled railway shed on the Tarka Trail (2 miles) – and The Puffing Billy Trading Co (01805 623050), also by the Tarka Trail, located at Great Torrington's old railway station – it’s our pick for breakfasts and lunches. From M5 it may be tempting to come off at Tiverton, but don’t – it is much easier if you get off onto the A30 at Exeter (end of the motorway), and go to Okehampton. Go into the town at Okehampton and, at the crossroads with traffic lights by the White Hart, turn right (signed A385) to Hatherleigh. At Hatherleigh, take the first exit at the roundabout and go as far as Highampton. On the sharp bend at Highamptom, immediately past the shop and Golden Inn, then take the right turn signed Sheepwash. Go straight through Sheepwash and on for 1¾ miles to a small rural crossroad at Filleighmoor gate (name of crossroad is on the downpost of the signpost). Carry on straight over the crossroads and briefly uphill to the brow, where Ruby's Orchard gate is on the left, opposite a big barn and just before the turn to Petrockstowe.